It was the night of December 23rd when I arrived it Rjeka. While I was on the train from Salzburg, Austria, my mom sent me a photo of her Christmas tree. I wasn’t missing it. I was not bothered by not being close to family for the holidays. Squint at it if you will. I was enjoying myself. Though some of the most fun, Salzburg was cold. THIS was nice. Mid winter and the weather was great. A long sleeved shirt was all I needed. I certainly over dressed for a day’s walk. Rijeka sits right on the water. It’s cupped in an inlet of the Adriatic Sea. Kind of like the armpit of Croatia – physically speaking. Rijeka is not an armpit in the least. Rijeka is stunning. Especially Opatija, which was a short 30 min bus ride north of Rijeka. Not a single photo I took while walking along the coast did Opatijia any justice. The city put me in the mind of a tiny Barcelona at times. But not entirely. I say Barcelona only because it’s European and on the coast. But this city is not like any I’ve visited. Perhaps the holidays had something to do with it but the calmness left a lasting impression. It wasn’t overly energetic or lacking any vibrancy. It was peaceful. A place where I would frequently vacation if I lived in Europe. Warm, quaint, friendly. Opatija and its lovely yellow brick roads. At night, Christmas Eve, I was in the city center where tons of people were out partying and drinking in public. Carried away by wine and the festivities I neglected to take pictures. But I do remember being hungry. I was looking for food but everything was closed. The only options I had were the sausage stands that served hot dogs, and sausage with mustard. No ketchup! That was it. A herd of people crowded around one in particular and it peaked my curiosity. I ordered one hotdog. It came back to me as this gigantic sausage accompanied by a bun. The bun did to the sausage what a bowtie does to a person. The width of 4 or so typical Oscar Myer weenies. It’s a hotdog that I had to wrestle for one bite. Then it left me wondering how the line was justified. Basic the hotdog was. Also, ketchup would’ve been so nice. I can’t do just mustard only. I don’t get how people do that. Enough about the hotdog. I danced, talked, socialized as liquor usually inspires me to. But there was more to be desired in the city center. The Hostel 1W is a place I would recommend for budget travelers. Each wing has a themed after a continent. Each bunk had its own power socket, closet and lamp. The bathrooms are private with heated towel racks. And the breakfast is superb. All for less than the equivalent of $15 USD a night. Remember to pack lightly because there is no elevator. There are tall spiral stares that make it quite the workout if you’re lugging. A last morning stroll through the town and the coast before leaving for my afternoon bus to Zagreb. The bus station was close to the water. And maybe 300 meters from the hostel. The sun rise on Christmas day made it one of the best Christmases ever. Everything was overflowing with gold light. I regretted having to leave.That afternoon, it was a $20 USD, 3-hour ride to Zagreb. I arrived at dark. The first thing I noticed was the difference in temperature from Rijeka that was only 3 hours away. Back to cold again. My hostel wasn’t walking distance to the station. I had to take a 10-minute trolley. But the ride was so spectacular. The city was brightly light with Christmas lights. It was beautiful. Something to see. The markets are so alive. From the window to window of the trolley, it was busting with energy and food. I was anxious to find my hostel so I could get up and out. From my stop the hostel was well hidden. An alley on what seemed to be a major street led me to the Swanky Mint Hostel. I would later find that this hostel would be among my top 3 favorite hostels. The service here is second to none. Music, a bar, lounges, swimming pool, open kitchen…help yourself to free food if you’re hungry. People from all walks. I immediately felt right at home. I slept in a room with bunks made of particle board but don’t let that stop you. Each guest in the room was given a key card for the room and a personal lock. The bathrooms were private with heated towel racks. I will say that the amenities were not as nice as the Hostel 1W in Rijeka BUT…the atmosphere is what makes this hostel so incredible. The hostel enriched my stay in Zagreb. Refer to Hostel World under the Travel Tips tab to read more about my experience at the Swanky Mint Hostel. I decided to take a look into the bar where everyone was gathered around, drinking and dancing. And I immediately found someone who was also interested in strolling through the Christmas markets. William from London. The markets and the city center were all within walking distance from the hostel. Mulled wine, cotton candy, ice-skating, churros, donuts. Santa hats, roasted chestnuts, glazed walnuts and pecans, candy apples, ice cream, snow cones, hotdogs (served with ketchup)…so much to stress out about at the gym. It is so easy to get carried away with the food. There is no stopping someone like me who wants to try everything. The churros were right on time. I’m a sucker for churros. Oh and chestnuts. I love it all. Stroll down the city square. The next day started early with breakfast. Outstanding! Cereal, waffles, toast, everything I needed for the day. The station wasn’t busy or crowded. After a short line I purchased my round trip ticket for the equivalent of roughly $15 USD. After boarding the bus I realized that I had eaten too much and it pushed me into a a coma for the better part of the 2.5 hours. When I arrived, there wasn’t much to see. There was a pavilion and a trail. The lakes were hidden. It wasn’t long on the trail before I caught a glimpse of something sparkling in the distance. Spectacular! Wooden planks that lead you through the lakes. The water was deep turquoise and still. Not many people. No distracting tourists that rob me of the authenticity. It was clean. Well protected. The air and wind and weather were all so tranquil, I knew I was going to spend the entire day here. It’s easy to take your time, and take in the sound of slow streaming water. My mistake was not bringing enough water. The water is so clear and appetizing; it’ll make you lick your lips. 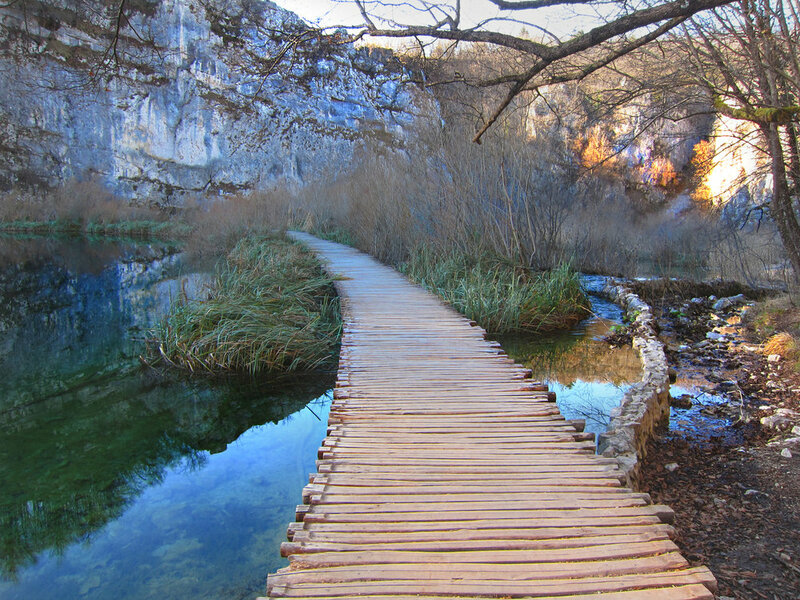 Wooden trail of Plitvice Lakes. When I made it back to my hostel I had one last night on the town. I wandered and found The Johann Frank, which is a restaurant and coffee shop. I know it to be a very unforgettable night club. Great music to dance to. People here dress up. Open dance floor. VIP section and waiters and waitresses who take your drink orders. It seemed to me like the place to be on any night. I will admit that stranger than normal looks were passed in my direction. I am used to standing out. I have been told I have that kind of charisma. But this was amplified on an exponential scale. After mingling with a gorgeous young lady she disclosed to me that not many dark skinned westerners are seen in Zagreb. Being rare, it was assumed I was “some celebrity from MTV or something” as she put it. That’s when I said, “oh you don’t recognize me? Kevin Hart is the name.” I have never been a fan of people comparing my likeness to his, so I ended the joke there. In reality I am a celebrity…just not yet. Without a doubt I had a fantastic night. If you visit Zagreb, you must come to this beautiful night club. It feels rich. It is a great place to enjoy yourself. And for me, the perfect spot to have ended this leg of my travels. Croatia is an lovely country. The portions I got to experience were absolutely stunning and filled me with memories that I’ll forever cherish.